Basic 2: Pie Oh My - Do You Know The Muffin Man? When I arrive, the ingredients for today's pie are already measured and laid out: flour, shortening, granulated sugar, modified cornstarch, a lemon, apples and butter. We begin by peeling and slicing apples and immersing them into a bowl filled with water and lemon juice. This will help prevent the apples from browning. One important thing I learn is that pectin is concentrated underneath the apple's skin so we try not to peel too deeply into the apple. Someone asked what the best apples for pie were: predictably, the answer is Northern Spy because they hold their shape when cooked. Suspiciously, I notice that all the stickers on the apples we were preparing said Cortland on them. After draining the apples, we toss them with a mixture of sugar, starch and cinnamon. Next, we make pie dough, augmenting the basic recipe with a bit of brown sugar. 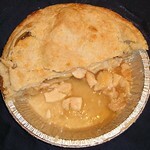 After rolling the bottom crust out, we line the plates, apply an eggwash to the edge and pour in the apples. The top crust is laid on top and the edges sealed. Our instructor abhors an eggwash coat as he feels it causes the top to darken too quickly before the pie is cooked. Instead, we brush the pies with a liberal amount of water and sprinkle them with sugar. Two dozen pies are loaded into the reel oven, and we are told to come back in about an hour. When we return to the lab, the pies are already cooling on racks and we place them in a bakery box to take home. The pie turned out alright: I tried to cut a slice while it was still warm, so the filling ran. I'm not sure what difference the modified corn starch made, but the filling was completely set when it finished cooling. 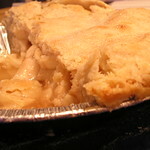 The crust was very flaky, but flavourless, as to be expected from one made with shortening. I asked the instructor about not chilling the shortening but couldn't quite understand his response, something about how we use the crust immediately and how the room was fairly cool.